Large adult - notice the flattened head defensive display, Monterey County. Photos © Gary Nafis. Adult, Humboldt County Juvenile, coastal San Luis Obispo County, just north of Santa Barbara County line within the accepted range for T. s. infernalis, but showing the dark head and small red blotches charactistic of the subspecies T. s. fitchi. This snake was found along the Napa River south of Yountville, which is close to where the T. s. infernalis subspecies meets the T. s. fitchi subspecies in Napa County. It looks more like T. s. infernalis to my eye, but some might call it an intergrade due to the fact that the entire head is not red. 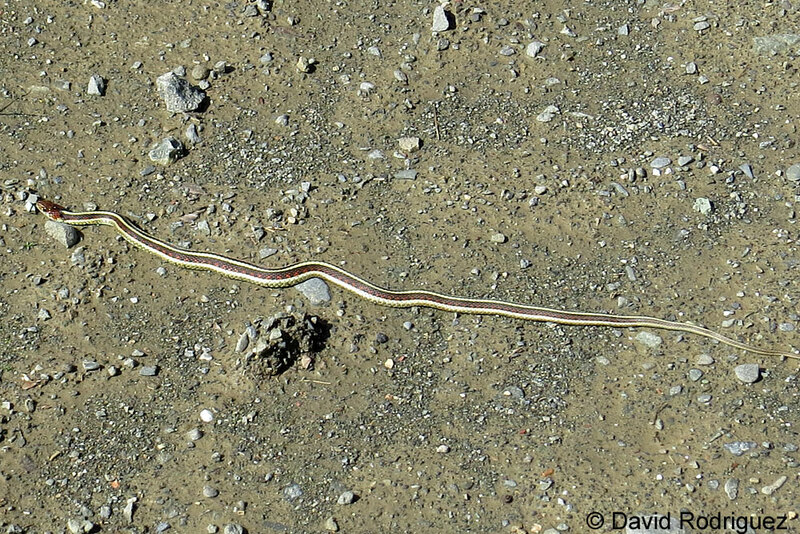 This adult snake, found in Sonoma County near the Mendocino County border, has an unusual amount of red on the sides that even covers some of the light side stripes. 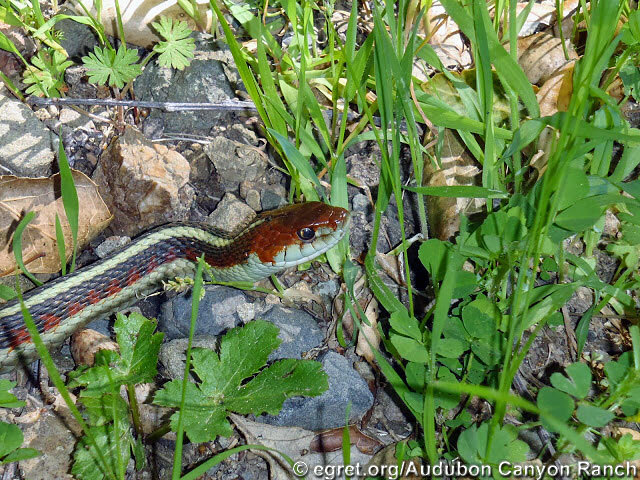 A red-sided gartersnake swims around in a small cattle pond on a sunny spring afternoon in Alameda County. I wanted to get a closer look, so I walked over to the snake's side of the pond, but then it swam to the other side, again and again, until I got tired of going round in circles. 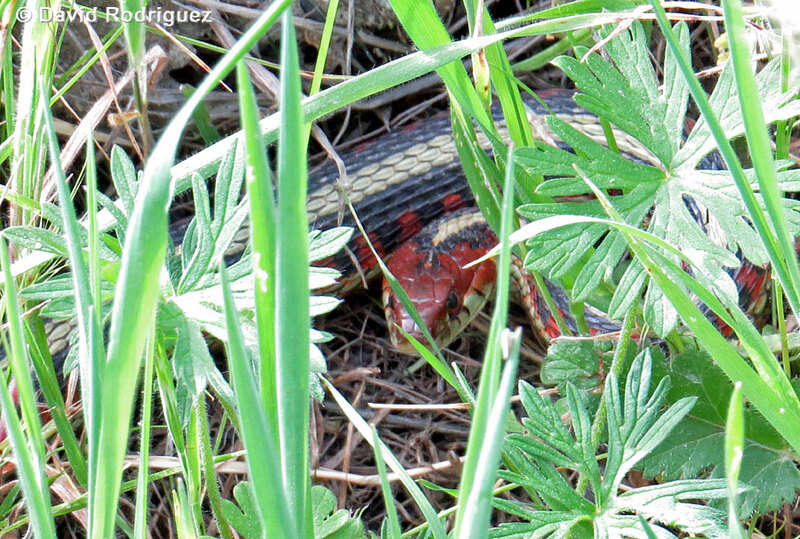 A huge feisty Red-sided Gartersnake from Santa Barbara County strikes out a few times at its captor. 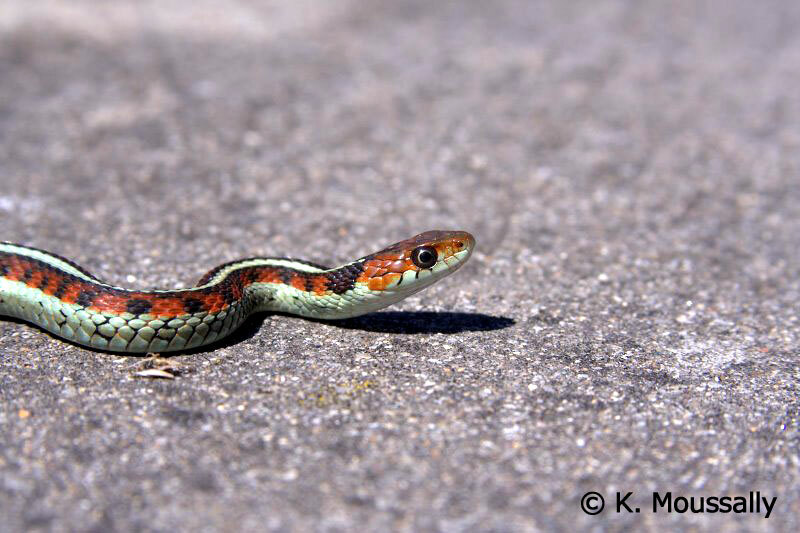 A juvenile CA red-sided gartersnake in Marin County. Adults of this species measure 18 - 55 inches in length (46 - 140 cm), but the average size is under 36 inches (91 cm). 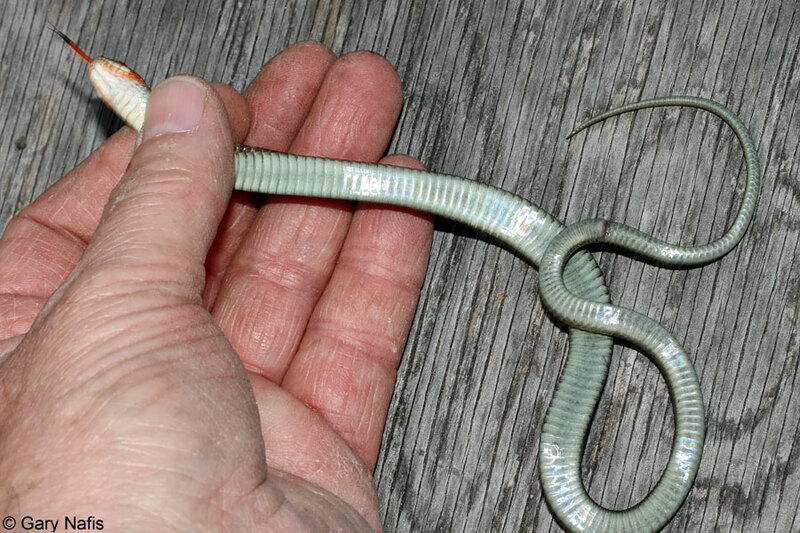 A medium-sized snake with a head barely wider than the neck and keeled dorsal scales. 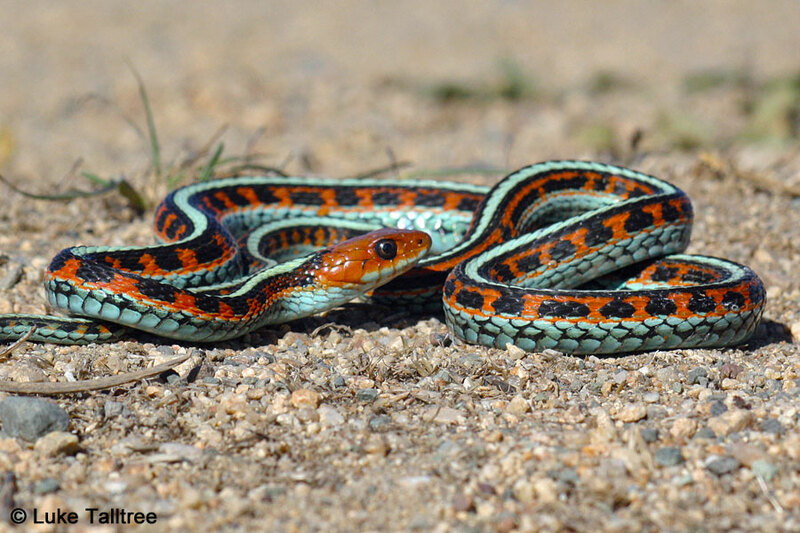 The eyes are relatively larged compared with other gartersnake species. 7, occasionally 8, rarely 6 or 9, upper labial scales, often with black wedges. The rear pair of chin shields are longer than the front. Average of 19 scales at mid-body. Ground color is dark olive to black. The dorsal stripe is wide and well-defined, and yellowish to bluish in color. 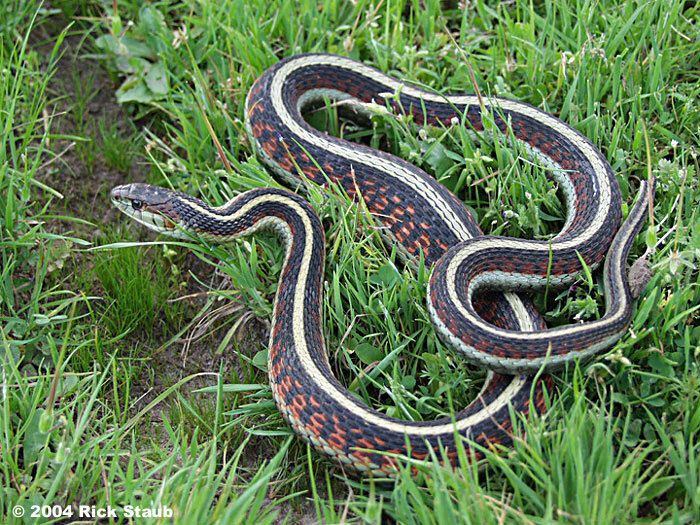 Light stripes along the lower sides are not very distinct, often blending in with the color of the belly. 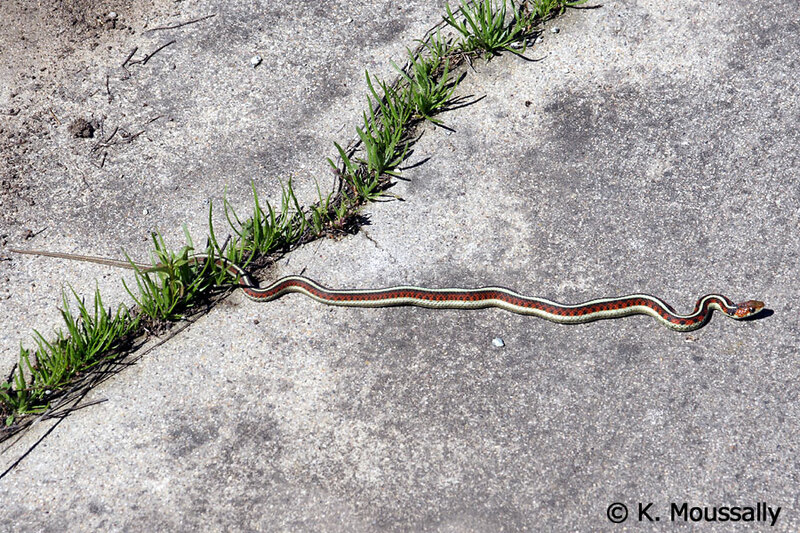 There are red bars alternating with the ground color along the sides above the lateral stripes. The head is red or orangish. The underside is bluish gray, sometimes with dark markings. Snakes with robin's-egg-blue stripes and blue underneath are found north of the Bay Area into Sonoma County at least as far north as Sebastapol and Santa Rosa. Snakes from Sea Ranch in Sonoma county lack the blue, so the transition takes place somewhere between Sebastapol and Sea Ranch. 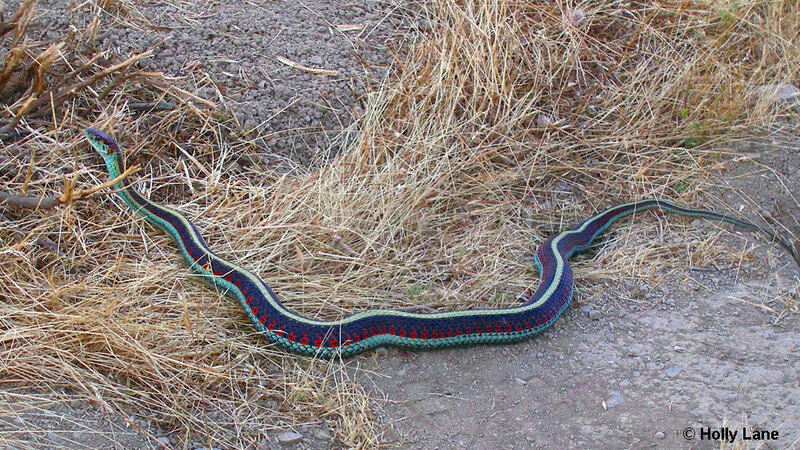 Some snakes in the southern part of the Bay Area may have bluish coloring with a yellow dorsal stripe. 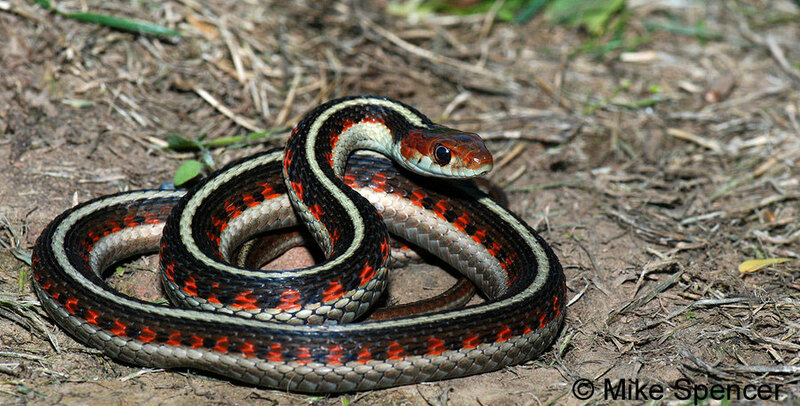 The species T. sirtalis is capable of activity at lower temperatures than other species of North American snake. Often escapes into water when threatened. 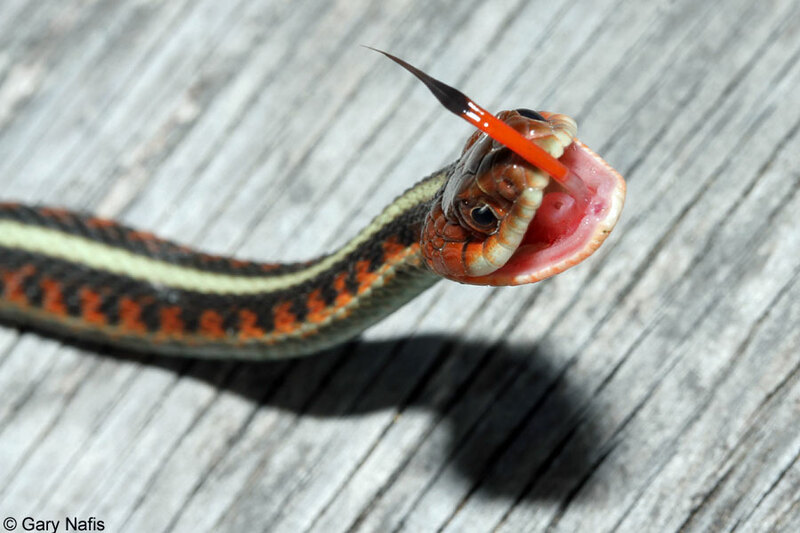 When first handled, typical of gartersnakes, this snake often releases cloacal contents and musk, and strikes. Eats a wide variety of prey, including frogs and newts and their larvae, fish, birds, and their eggs, small mammals, reptiles, earthworms, slugs, and leeches. This species is able to eat adult Pacific newts (genus Taricha) which are deadly poisonous to most predators. 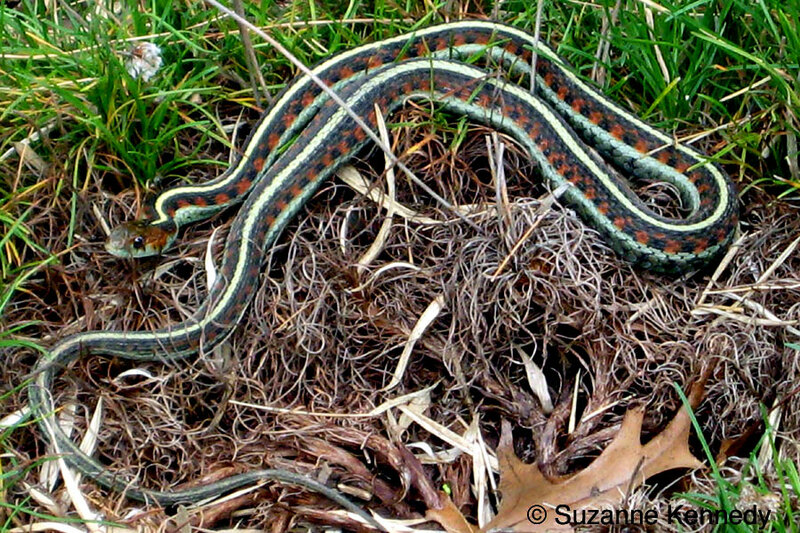 There is evidence * that when Common Gartersnakes (Thamnophis sirtalis) eat Rough-skinned Newts (Taricha granulosa) they retain the deadly neurotoxin found in the skin of the newts called tetrodotoxin for several weeks, making the snakes poisonous (not venomous) to predators (such as birds or mammals) that eat the snakes. Since California Newts (Taricha torosa) also contain tetrodotoxin in their skin, and since gartersnake species other than T. sirtalis also eat newts, it is not unreasonable to conclude that any gartersnake that eats either species of newt is poisonous to predators. Mating occurs in the spring (and possibly the fall ) and young are born live, spring to fall. Utilizes a wide variety of habitats - forests, mixed woodlands, grassland, chaparral, farmlands, often near ponds, marshes, or streams. 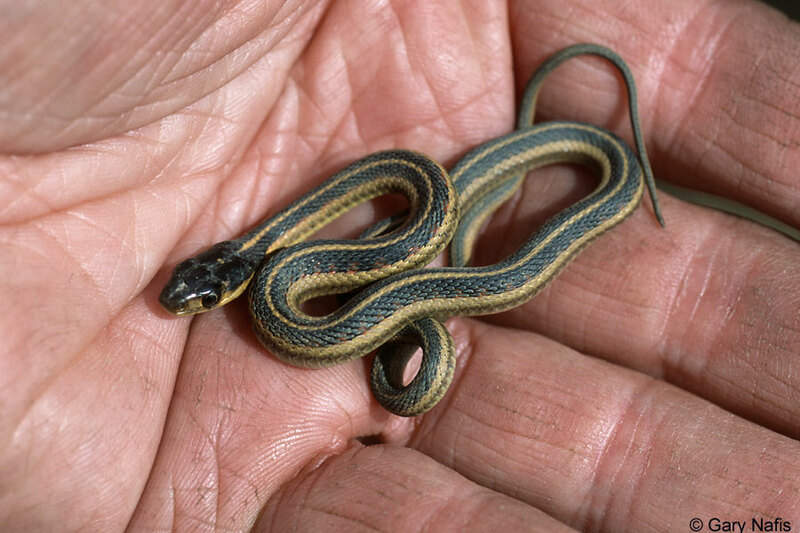 The species Thamnophis sirtalis - Common Gartersnake, has the largest distribution of any gartersnake, ranging from the east coast to the west coast and north into Canada, farther north than any other species of snake in North America. 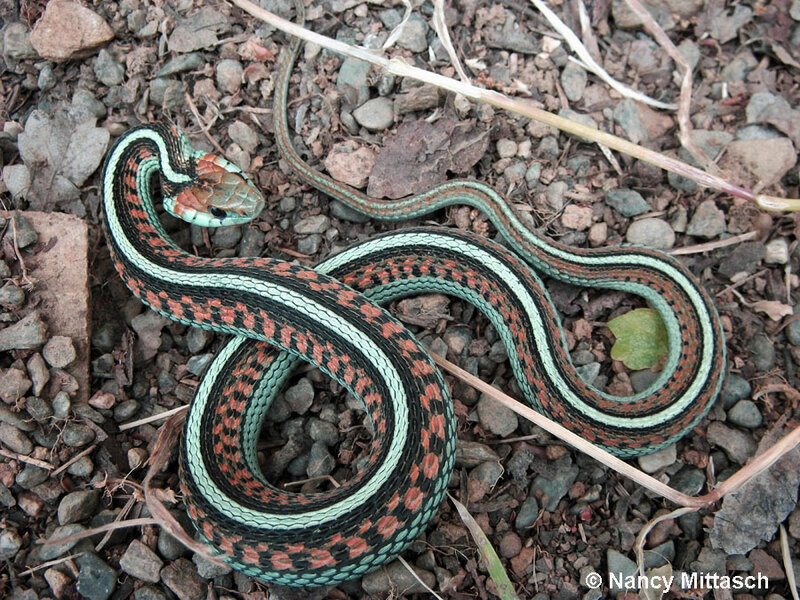 This subspecies, Thamnophis sirtalis infernalis - California Red-sided Gartersnake, is endemic to California, ranging from Humboldt County south, along the coast ranges (excluding much of the San Francisco peninsula) and east of the San Francisco Bay along the central and south coasts to San Diego County. 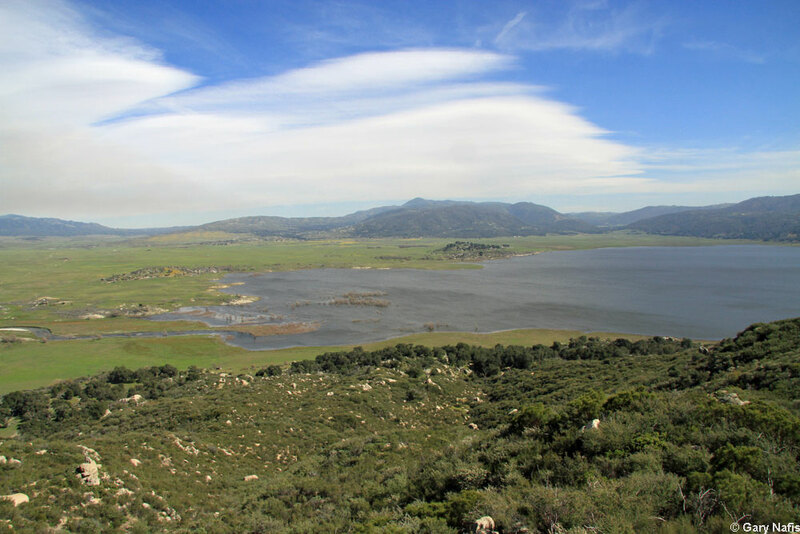 Subspecies present in the Coast Range area between Monterey and Ventura Counties. - Rossman et al. 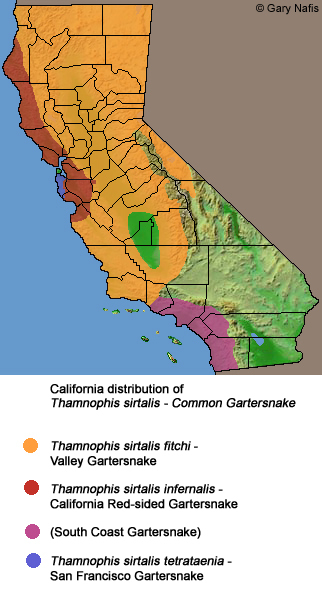 in The Garter Snakes - Evolution and Ecology 1996 * show T. s. fitchi as the subspecies present along the central coast from south of Monterey Bay to Santa Barbara County. - In a 2002 study of western T. sirtalis, Janzen et al show T. s. fitchi as present in the area. A herpetologist who has surveyed the area told me that snakes in the area he has found have all keyed out to be T. s. fitchi - from the Salinas Valley south to Vandenburgh in Santa Barbara County. I don't have the resources to check all of the museum specimens from the area, but until I see evidence that T. s. infernalis also inhabits the area (T. s. fitchi clearly is there) I'll show only T. s. fitchi. If you have seen pictures or other evidence of T. s. infernalis inhabiting the area, please let me know. SSAR Herpetological Circular No. 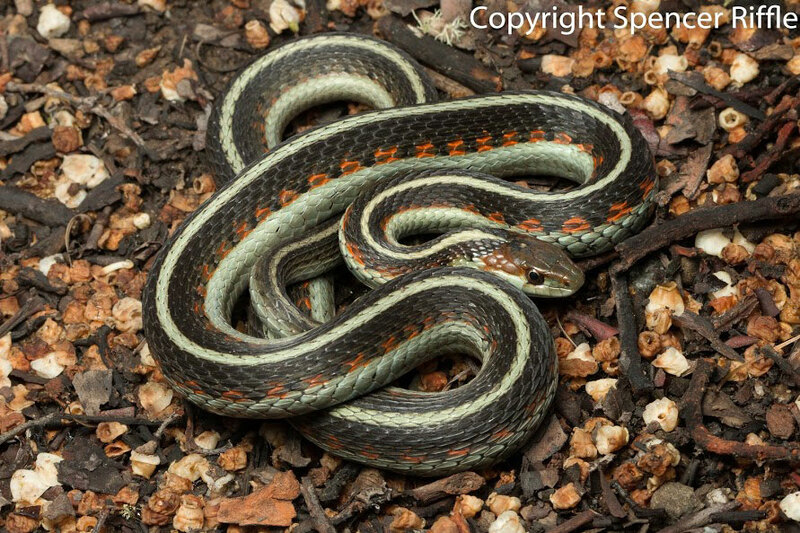 43, 2017 shows this note regarding the species Thamnophis sirtalis: "Analyses of mitochondrial and nuclear data suggest that this species may be composed of multiple independently evolving lineages often not concordant with the subspecific taxonomy (F. Burbrink, pers. comm.)." 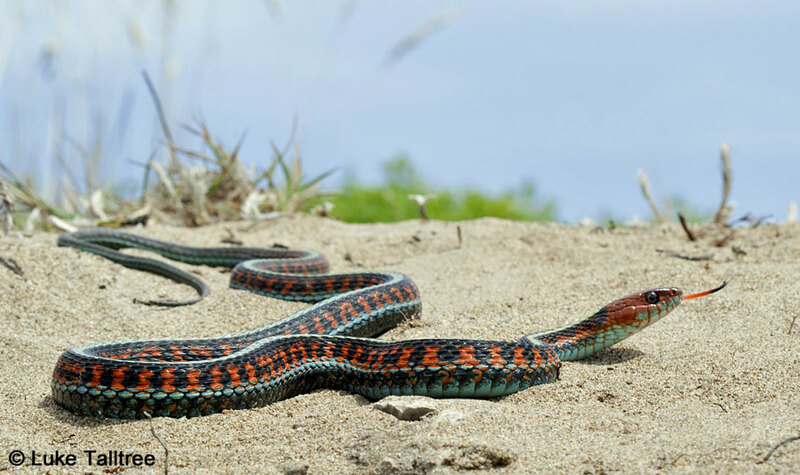 In 1995, Doug Rossman and Jeff Boundy re-named the Thamnophis sirtalis found on the San Francisco Peninsula T. s. infernalis, (removing the name T. s. tetrataenia, but recognizing that the snakes were still subspecifically distinct), and lumped the coastal T. sirtalis with T. s. concinnus. This taxonomy is shown on the range map in the 1996 book, The Garter Snakes - Evolution and Ecology 1. In 1998, Sean Barry and Mark Jennings petitioned the International Commission on Zoological Nomenclature (ICZN) to restore the previous nomenclature 2. 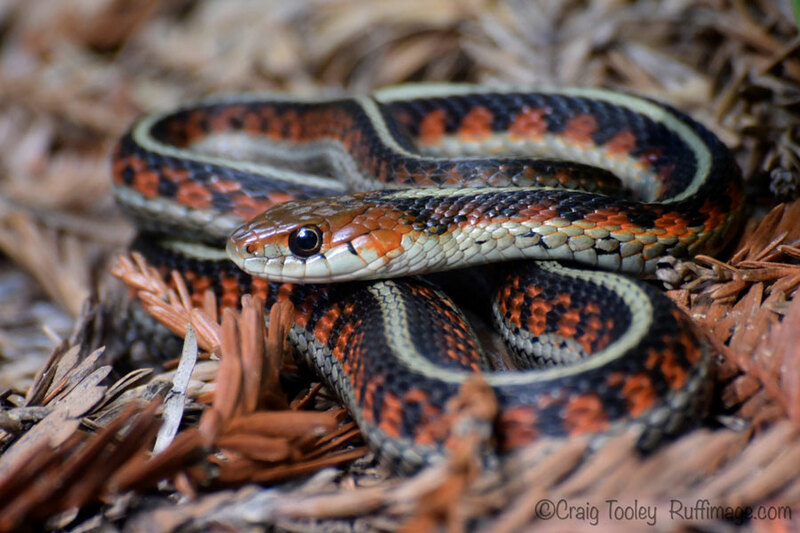 With no opposition from Boundy or Rossman, the ICZN agreed to restore the name T. s. tetrataenia to Common Gartersnakes on the San Francisco peninsula 3. Nevertheless, some authors either missed the restoration of this nomenclature or chose to ignore it, and their work still reflects Rossman and Boundy's nomenclature. 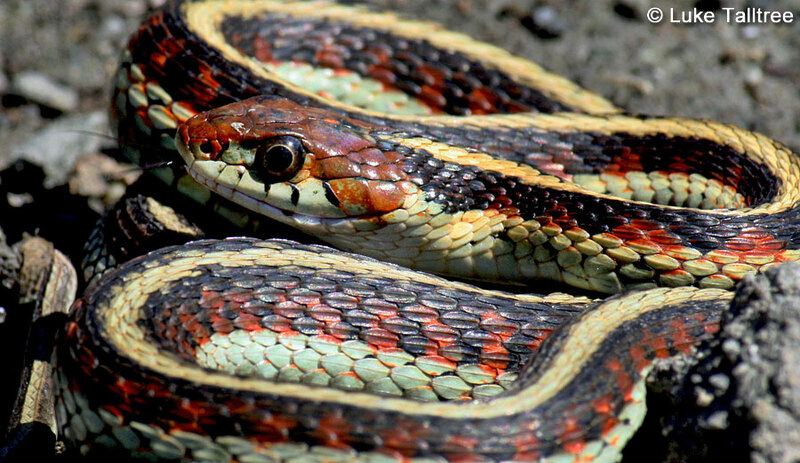 The State of California has designated Common Gartersnake populations along the coastal plain from Ventura County to San Diego County as a Species of Special Concern. 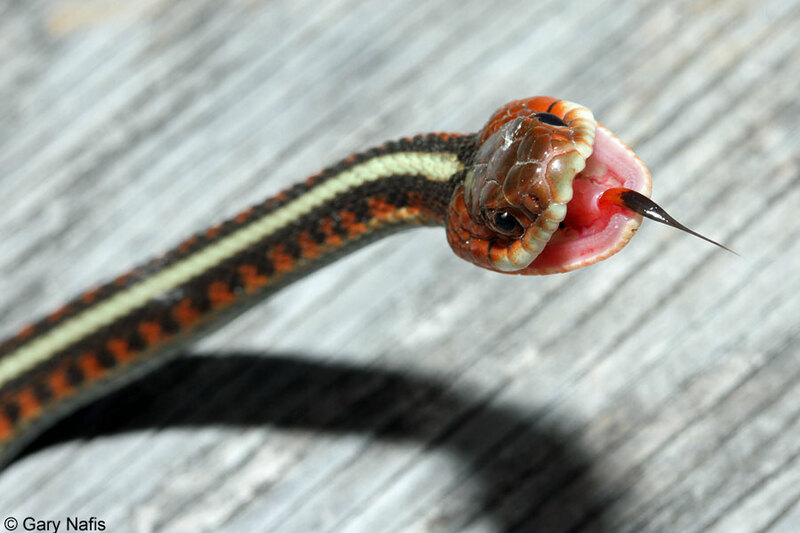 These snakes are listed as a separate subspecies by the California Dept. of Fish and Wildlife's Special Animals List - T. sirtalis ssp. 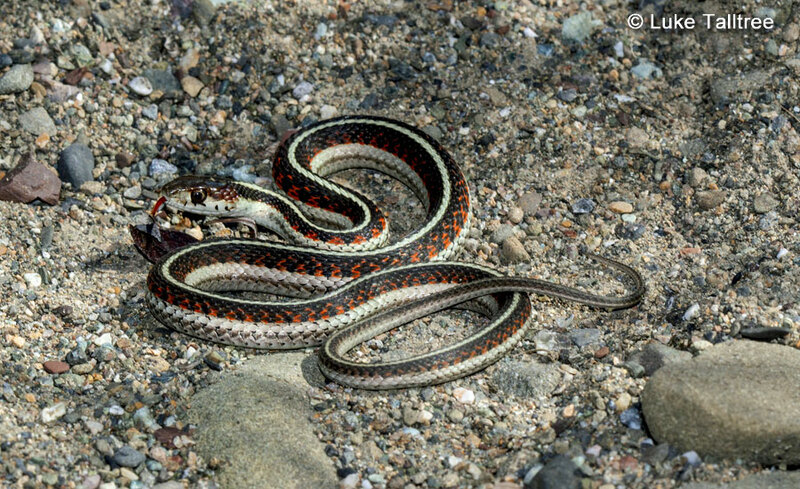 - south coast gartersnake (Coastal plain from Ventura Co. to San Diego Co., from sea level to about 850 m). 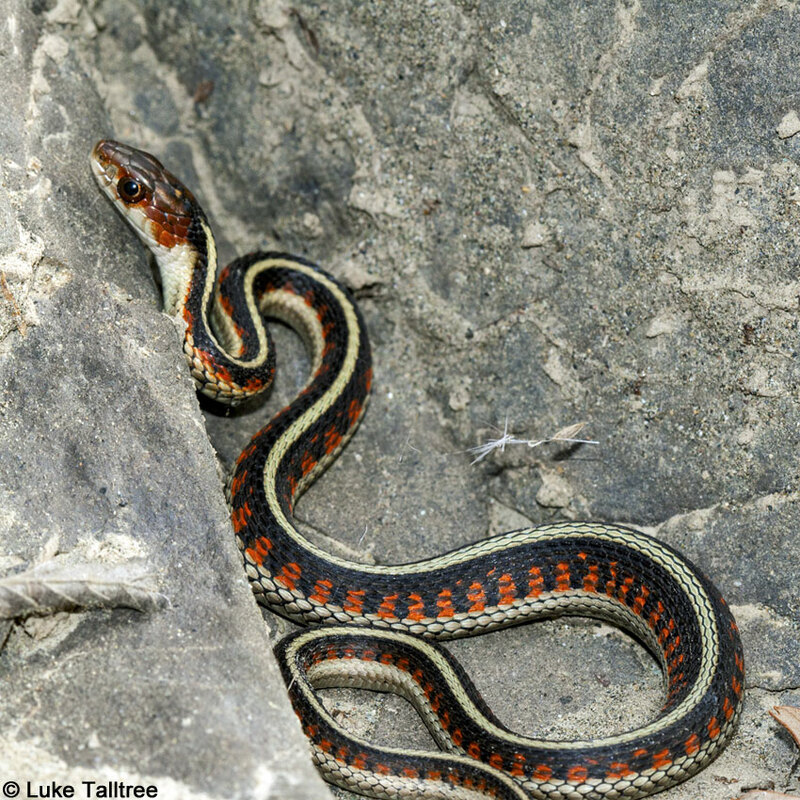 In its 2018 Sportfishing Regulations, the California Department of Fish and Wildlife restricts the take of south coast common gartersnakes in L.A., Orange, Riverside, San Diego, and Ventura counties. 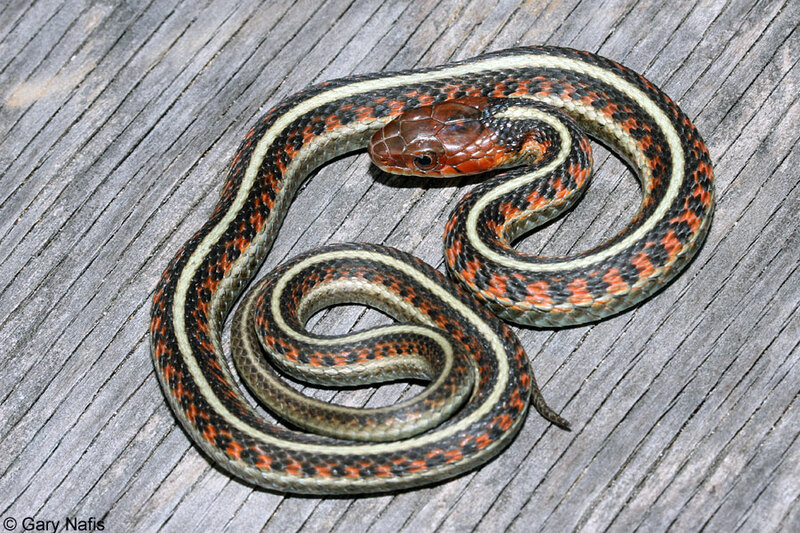 The South Coast garter snake appears restricted to marsh and upland habitats near permanent water that have good strips of riparian vegetation (Grinnell and Grinnell 1907; S. Sweet, pers. comm. ), probably because such sites provide the right combination of prey and refuge sites. Historical records of this taxon also exist for meadow-like habitats adjacent to marshlands (Van Bloeker 1942). Data are lacking on the microhabitats required for bearing young. Status: Endangered; of the 24 known historic localities for this taxon, 18 (75%) no longer support snakes. 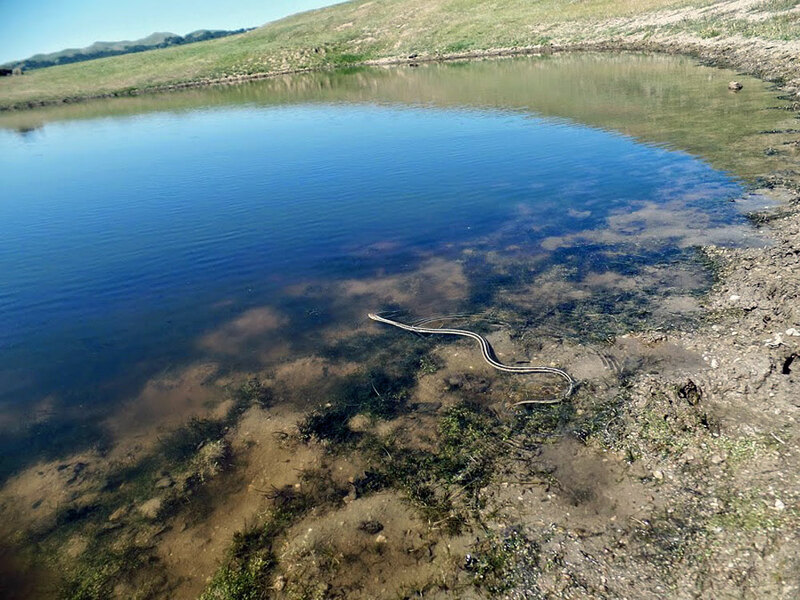 Extensive urbanization and flood control projects have destroyed most sites; some more isolated locations, such as in the Santa Monica Mountains, appear to have lost snakes following heavy floods or extended droughts (DeLisle et al. 1986). Habitat loss through agriculture, urbanization, and flood control projects, as well as the presence of many introduced aquatic predators threatens the six remaining localities where this snake still exists. This taxon can be notorious difficult to find in some areas (Klauber 1929; S. Sweet, pers. comm.)." 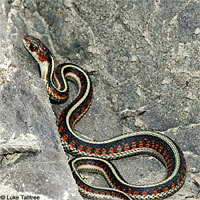 Garter Snake, Southern Populations, Thamnophis sirtalis (Linnaeus 1758). 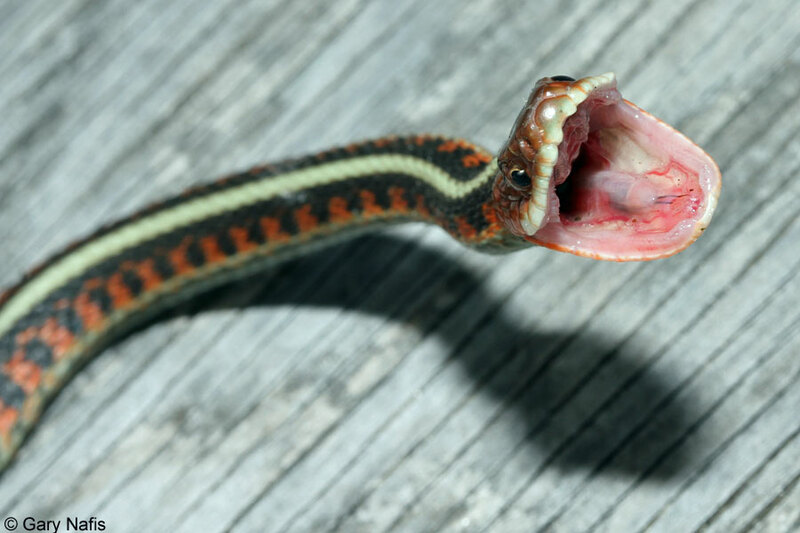 They remark that southern coastal populations of T. sirtalis have not been formally described as a distinct taxon, mentioning some ongoing studies on them, and discuss the snake's life history, taxonomy, the nature and degree of threat to it, and more. The northern population of T. sirtalis is not considered threatened. 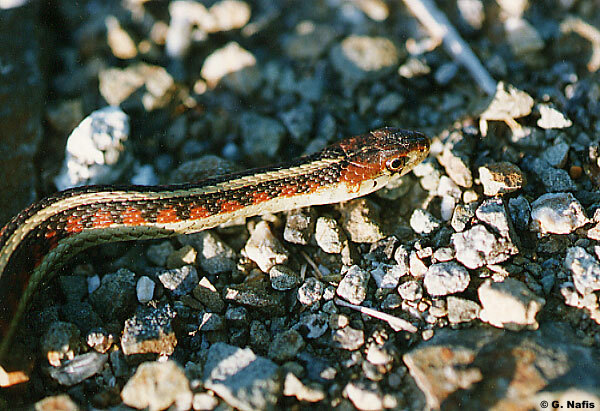 The California Department of Fish and Game lists the South Coast Gartersnake as a California Species of Special Concern. 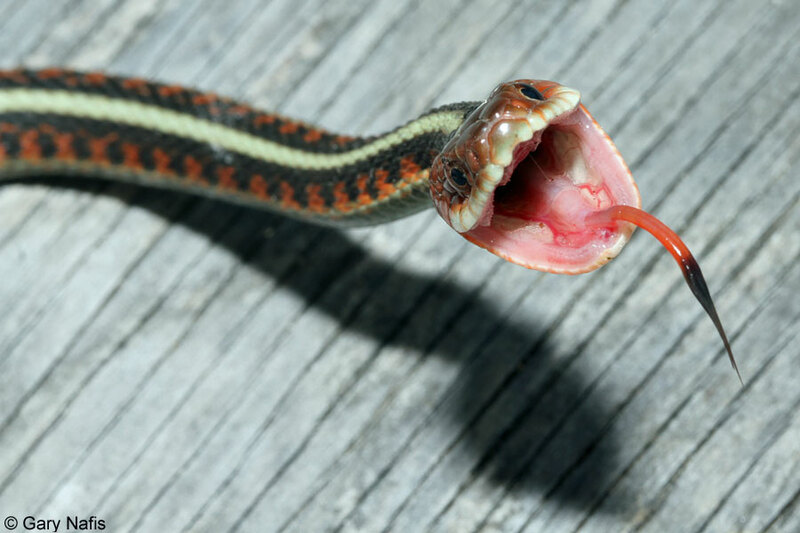 Jennings and Hayes in a 1994 publication state that 75 percent of the known historic localities for this snake no longer support snakes due to habitat loss from urbanization and flood control projects, floods, extended droughts, and introduced aquatic predators. In California Amphibian and Reptile Species of Special Concern (2016) the authors remark that southern coastal populations of T. sirtalis have a "...very small range in a heavily-impacted part of the state. In addition, these populations have been extirpated from most of their historical range, which justifies a Priority 1 Species of Special Concern designation." The authors attribute the population decline of the taxon to habitat loss and fragmentation and natural events such as floods and droughts. They mention possible threats from introduced aquatic predators, introduced water snakes, and vegetation shifts and the availability of intermittent and ephemeral water bodies utilized by the species due to climate change. * Rossman, Douglas A., Neil B, Ford, & Richard A. Siegel. 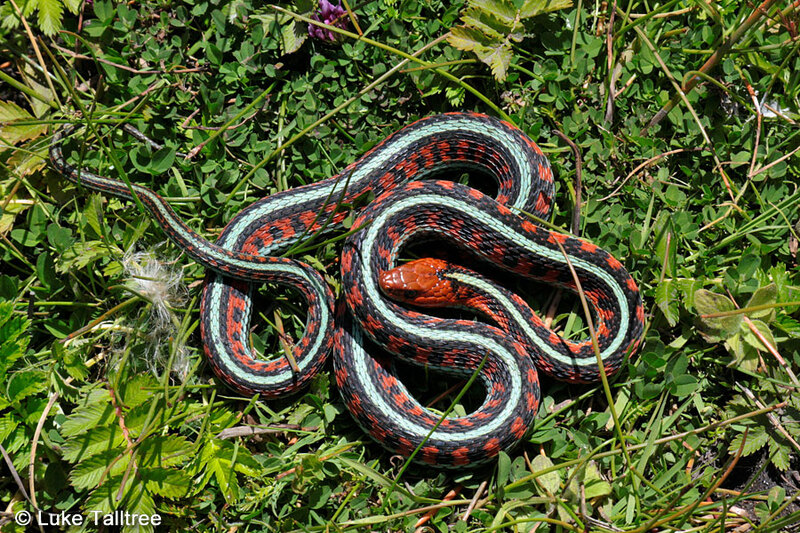 The Garter Snakes - Evolution and Ecology. University of Oklahoma press, 1996. The species T. sirtalis is not included on the Special Animals List, which indicates that there are no significant conservation concerns for it in California. T. sirtalis populations along the coastal plain from Ventura County to San Diego County are listed as a separate subspecies by the Special Animals List - T. sirtalis ssp. 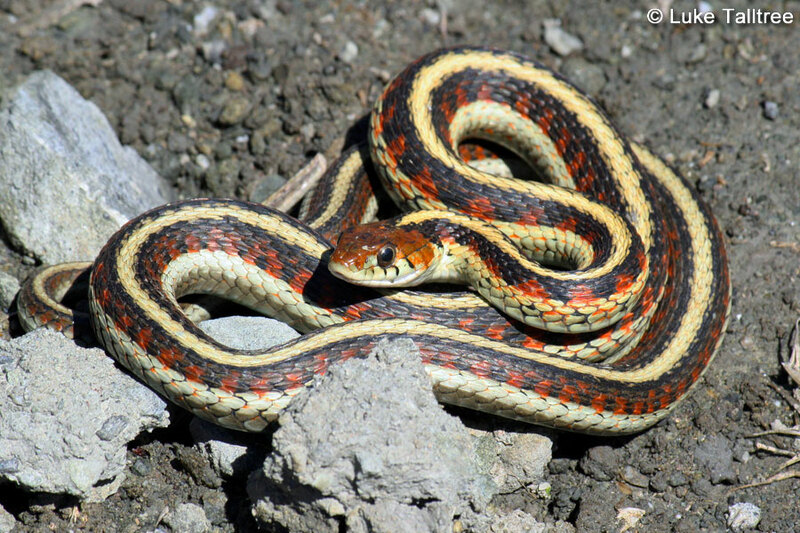 - south coast gartersnake (Coastal plain from Ventura Co. to San Diego Co., from sea level to about 850 m) and a California Species of Special Concern. 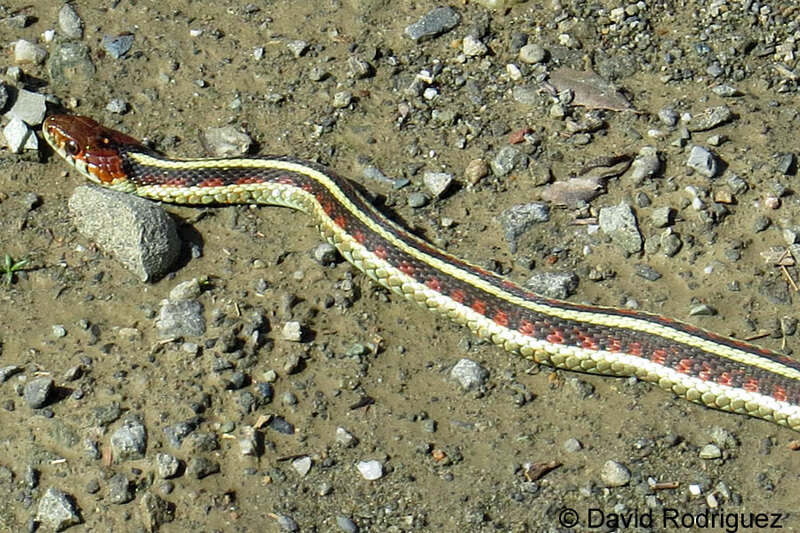 The California state rankings and listings shown below apply only to the South Goast Garter Snake - T. sirtalis ssp. NatureServe Global Ranking G5T1T2 The species is: Secure—Common; widespread and abundant.